Well hello and welcome to the final round of the 2016 New Quilting Bloggers Blog Hop. Thank you for stopping by and thanks to Stephanie (Late Night Quilter), Yvonne (Quilting Jetgirl), and Cheryl (Meadow Mist Designs) for organising this blog hop. I live in Berlin, work full time, learn to play the Ukulele, love board games and cinema and cooking nights with friends and am prone to write novel length blog posts if not stopped in time. The reason I got into blogging was the participation aspect of it. I wanted to get in contact with the quilting world beyond my living room and to participate in all the sewing fun organised online. 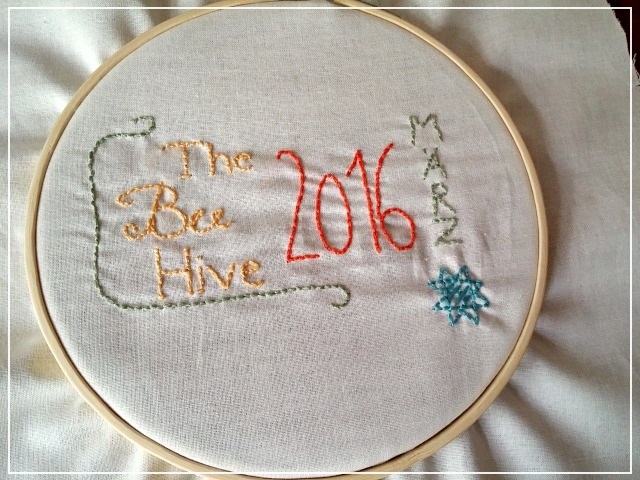 I promptly joined two quilting bees - 'Stash Bee' and 'The Bee Hive' - this year, which I enjoy immensely. The origin story of the name can be found on my ‘About me’ page but the short of it is that it is an endearment my grandfather on my mother’s side coined for all the little girls born into the family. The nickname was passed from girl to girl as long as my grandfather was alive. ‘Puppi’ is the cute form for ‘Puppe’ the way ‘dolly’ is for ‘doll’. ‘La la’ are merely nonsense syllables. As other bloggers before me have already mentioned, all sewing related blog names, puns and plays on words had already been snapped up and in the end I gave up and chose a blog name entirely unrelated to sewing. So there you have it: ‘Puppilalla’ aka ‘little dolly’. What I enjoyed the most about this blog hop – my first by the way – was to read along with the other participant’s stories. They had some good quilting tips to share too. The most useful bit for me was the blog critique I received from follow bloggers in my ‘Hive Sewciety’ group. I have already incorporated some of their advice and am still mulling over other bits. For example, as recommended, I moved the facts about me that were hiding at the bottom of the ‘About me’ - post to the top of the article, so they are more easily accessible. My writing tone has been described as being rather matter-of-factly. =) The feedback was that it might be hard to get to know 'your humble narrator' as I tend to concentrate on writing about sewing only in my blog posts. Guilty as charged! In corporate personality speak, it is called being ‘task oriented’. Partially, this due only having blogged for less than a year - blog birthday coming up in August - woohoo. I am still in the process of gauging what my blogging tone might be. Is colloquial speech OK? Will the blogger police be on my case if I dare to swear in a post? How much to share of my private life? Is there an etiquette concerning political correctness? I am interested in your thoughts so please feel free to comment and share your opinions in the matter. 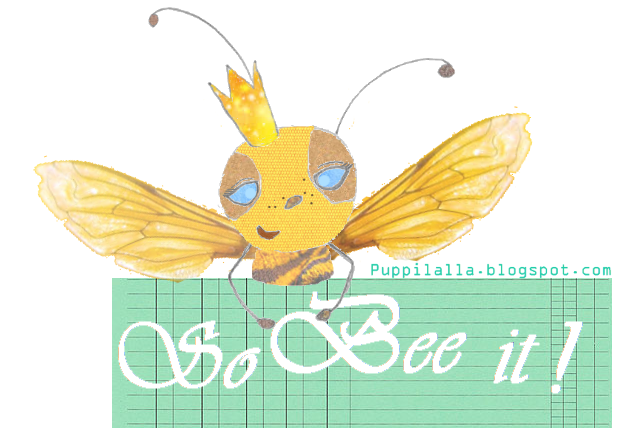 I have had private conversations but up until now, I kept private talk with fellow bees and blog commentators to e-mail exchanges behind the scenes of the blog. It was also noted that there are no links to further social media channels. Well, I guess there is no escape from them and sooner rather than later, I might have to add them, but every other channel you add, wants perpetual up-keep and maintenance, which I cannot be bothered with just now. 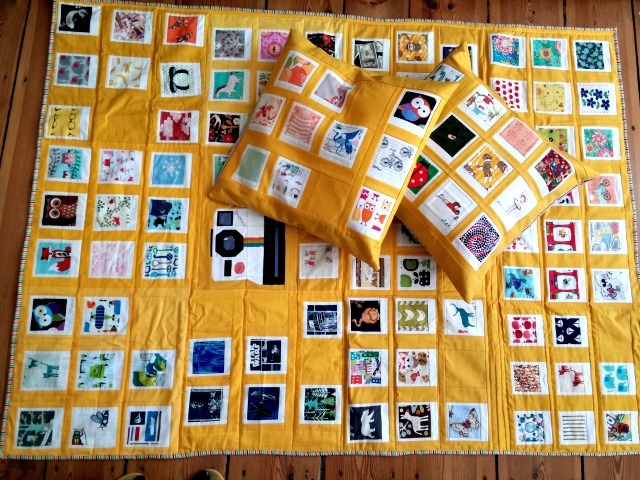 In preparation for this blog hop it was suggested that we show a few pictures of quilts we finished, so people could get a feeling for our ‘style’. Now here is a conundrum! I have recently read a post, in which the author expressed the sentiment that she thought herself working on many quilts she not necessarily would want in her own home herself. I related to her words instantaneously. Most of the quilts I made, I made to meet the taste of the intended recipient rather than my own. Therefore, I would not consider my limited work to date to be representative of my ‘style’. If you want to get an impression of what I like, I have a pinterest board that collects pictures of quilts that have caught my eye for one reason or another. I think were general inclinations are concerned, I can say, I like bright jewelled, modern, and low volume quilts with a lot of negative space, while rainbow, country house style, batik and crazy quilts are not my personal must-have-want-to-do cup of tea. This simple ‘Snowball Block’ quilt was the first one I kept for myself. It lives on my bed now and I just love it. I plan to slowly work towards more complex designs from here on in. Well, I really like Jenny’s tip on how to sew on bias tape to the completed quilt in such a way, as to make it impossible to make out the start and the end point of the bias tape. As there is no need to reinvent the wheel by getting into a lengthy explanation, I refer you to the Missouri Star Quilt Company 'Ultimate Quilt Binding Tutorial' video. The technique is really neat. What else? I only commenced sewing properly in 2013 and I tend to have long pauses between the finished pieces although I have done more sewing this year than ever before. Not having a fixed sewing space and having to move things around all the time, contributes to the pauses. But I am having more fun now that I am sewing along for and with other quilters. I enjoy the quilting community, which I find very generous and supportive. See, told you, novel length post again. OK, lets roll this up with a quick fun fact about my stash. It contains next to NO true blues, yellows, reds and greens. Yes, seriously. My stash is pretty much exclusively made up of secondary and tertiary colours and some low volumes. Way to go stash building wise. Thanks for having taken the time to stop by and don’t forget to also check the posts by my fellow ‘Hive Sewciety’ bloggers this week. Oh right! – Prizes! Enter the giveaway for the chance to win one of the lovely prizes Stephanie, Yvonne, and Cheryl so kindly organised for the 2016 New Quilting Bloggers Blog Hop. I hope you will keep checking back. This is a fun post! I like the social aspect of blogging as well but you knew that already. Good to hear of that negative result. It's interesting that you only have tertiary colours in your stash...and I think many quilters make quilts for the recipients, although it is always nicer if it's fabric you love as well. 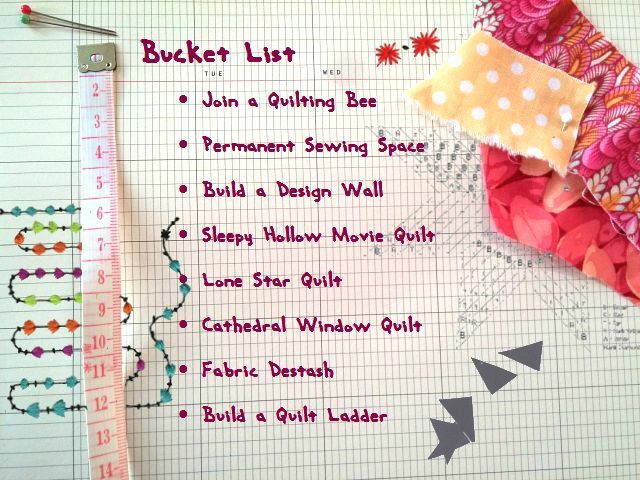 Love your quilting bucket list! And your polaroid quilt. 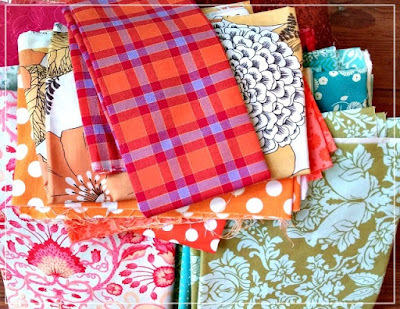 it's one that I'd like to make some day but I have absolutely no fabrics in my stash that would work for one. Yay! Another excuse to go fabric shopping! I've enjoyed getting to know you Katrin and look forward to become online friends. I faced the same problem but then 'Quilters to the rescue!' I merely asked for help and presto got it too. I guess you could ask for orphaned Polaroids if you were fine with getting all sizes or you ask your trusty quilting network, i.e. your Hive Sewciety mates =) for fussy cuts in the size of your choice. You would have the fabrics you need in no time. Hello Berlin from NW Pennsylvania! Thanks for sharing. Such a fun post. It was fun. To learn about you. It has been fun. Getting to know you. I love the quilts you have done. I really enjoyed reading your "novel length" post and getting to know more about you! Your blog is amazing and the personality that comes true is really awesome too, had me smiling all through. I love that yellow Quilt and thank God for the good news about the boy :) I'm reading about all these Quilting Bees I think it'll be a crime if I don't join one soon. Thanks for the wonderful tips. i love the polaroid quilt and the loving thoughts behind it. glad the news is good for the little boy. Such a great bucket list! I'm trying to destash, too - mainly by only using fabrics that I already have when making new quilts (it's hard!). Great to connect with you, and look forward to seeing the quilt ladder! I just want to say that I love your writing style, it's like a force of energy that encouraging me to get up and get at it! Your Polaroid quilt is so wonderful and that's great news about the little boy who received it. I really enjoyed your post, so honest, and your personality came through loud and clear. I don't really do other social media either, I would only be duplicating what is on my blog so to me there is no point. Stay true to yourself, you are doing great. Great to meet you, Katrin. Love your quilts and hope to see more in the future. 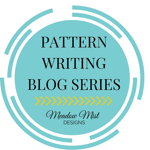 Your quilting tip looks really interesting and even though your blog tip WAS gobbledygook to me it sounds like something i need to know about :-). Lovely post and nice to meet you!I am really enjoying the quilting community, its so welcoming and reassuring. Cheers. Hi Katrin! What a nice post. I think your personality comes through just fine. I haven't started adding other social media yet either. Well, partially because I haven't started any of those accounts yet. :) I'll get there though. Great tip on the ALT TEXT, I hadn't thought of that, but it will add so much to our exposure out there in the search world. Thanks! Wonderful to hear of Hanno's negative result. I'm very happy for him, his family and you! It was nice to read more about you! Always so happy. Glad I came by! Great post! I write long ones so they don't bother me. I'd rather hear what you have to say! So interesting that you have no primary colors in your stash. I hope though that you make quilts from time to time that speak to your heart and not always things that others want you to make because that's such a joy! Very nice to meet you through your blog! I have been quilting for about 7 years and still do not feel like I have a specific style! I enjoy several different techniques (paper piecing, traditional, modern, thread painting, art quilts, bed quilts) and maybe within each I have a style. 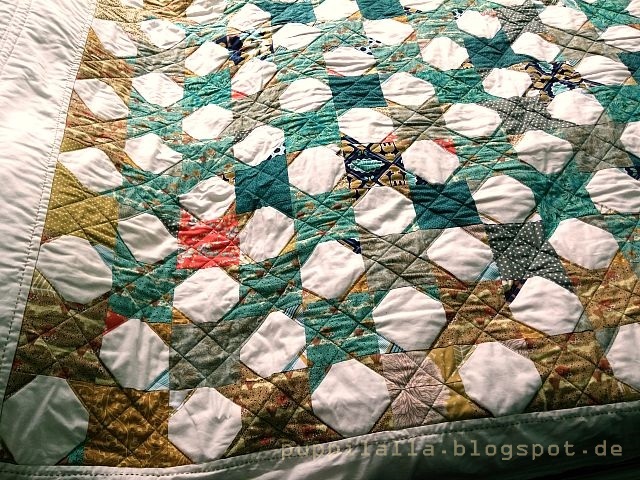 Oh how fun that you are in the New Quilt Bloggers Katrin! When you described the things you like to do, you sound very much like my daughter... right down to the ukulele. :) I think your blog looks lovely and that your writing style is warm and welcoming. It's good to be task oriented. I too mostly make quilts to other people's tastes, because I rarely keep anything I make. Plus, it's just plain fun to experiment with many different styles. I think your personality comes through in your writing, and I enjoyed learning more about you. That Polaroid quilt looks like a labor of love, for sure. Good blogging tip. I've been trying hard to enter alt text and a description to all of my photos, too. I really like your banner graphic! Great getting to know you through this post and the blog hop! I really like your blog and your quilts. Can't wait to see the next one you make just your style! Katrin, great intro post (and bucket list)! So glad to hear about the negative report for the little fellow! I'm sure the quilt provides so much comfort! And thanks for the tips!